Over the last seven years, I have helped develop and teach retirement income planning to thousands of financial service professionals as part of the American College’s Retirement Income Certified Professional (RICP) designation. Retirement income planning is what called me to the College and the RICP program. I could see the value, I could see the growth, and more importantly, I could see the need for more education and focus on the topic. But retirement income planning is not just a hot new buzz word, it is an essential part of the financial planning world’s present and future success. During my seven years with the RICP program, I saw roughly 6,000 professionals graduate, and another 11,000 are currently enrolled. Those numbers are staggering! Retirement income planning has gone from a niche area of planning to an essential offering for many advisors because it is where the money and market are, not to mention your clients’ needs. It also presents unique challenges that are not seen in all other areas of financial planning. That’s actually why I wrote my book Rewirement – to highlight how you need to change the way you think from saving for retirement to generating income in retirement. Retirement income planning is more popular than it has ever been. More investors are seeking it, and more advisors are specializing in it. With all of the buzz around retirement, it’s important that advisors understand how to help investors appropriately. First, it is important to just grasp what retirement income planning is all about. I often describe retirement income planning as trying to hit a moving target in the wind. The target is the client’s goals. I strongly believe that retirement income planning should be goal-based planning at its core. Everyone has different goals and risks in retirement – there is no one-size-fits-all plan. It should also be focused on the client and what they want to accomplish. Financial planning is not done in a silo. It is a means to accomplishing the client’s desired outcomes, which usually include a secure and happy retirement. So the target is the client’s goals, and the reason the target is moving is because of longevity. One of the biggest challenges in retirement income planning is trying to generate a certain amount of income for an uncertain period of time because we do not know how long someone will live in retirement. When you prepare for a trip, you pack and budget according to how long you’ll be gone. Retirement income planning is like helping someone budget for a trip that will end eventually, but you don’t know when. Longevity risk makes retirement income planning so much more challenging. If we knew that you would be in retirement for 17 years, four months, and six days, it would be a lot easier to set up a solid income plan than it is in reality, when you don’t know if your clients will spend one day or 40 years in retirement. Because of retirement’s uncertain timeline, we must be a bit more conservative with our spending than if we knew the exact cost and time period. So the target is moving, which complicates things, and then there’s the wind. The wind can push us off track if we plan to just go in a straight line from point A – the start of retirement – to point B – the end. I liken the wind to the risks and changes that occur along the way. Social Security, tax laws, and Medicare are crucial to any retirement income plan, but none will stay the same across your retirement, especially if you plan on spending 20 years or more in retirement. For instance, tax laws likely won’t stay the same for even a year, as they are modified constantly. Then with Social Security and Medicare’s funding issues, both programs are primed for significant changes in the next decade. As Social Security and Medicare are fundamental bedrock programs for many retirement income plans, significant changes to the program could throw many income plans off track. As such, we need to account for uncertainty by building some flexibility into the plan. The wind also should teach us the danger of relying solely on just a few income sources or government programs for retirement. Diversifying income sources can help reduce risk just like diversifying investments can help reduce certain investment risks. Millions of Baby Boomers are now over age 70.5, and millions more will turn 70 this year. Money is pouring into IRAs, which are really more of a housing and management vehicle for income planning than a true savings vehicle. Just look at the newest data from the Investment Company Institute, which shows that there is now over $9.5 trillion in IRAs and $8.1 trillion in defined contribution plans, and $3.2 trillion in private pensions. This aggregation of assets into IRAs is not slowing down but accelerating. IRAs don’t have default distribution options or annuities built into them like ERISA pension plans. Instead, retirees will need to generate their own paycheck from their IRA and decide how they will distribute money to generate a secure retirement income distribution. Advisors need to take the focus on retirement income planning seriously. This means educating yourself about it, getting a process in place that is scalable and repeatable, and instilling the importance of income planning to your clients at an early age. Income planning doesn’t start when you reach retirement. It begins years before while you are still saving. It means managing risks, saving enough, diversifying, getting insurance, investing correctly, and doing strategic tax planning. 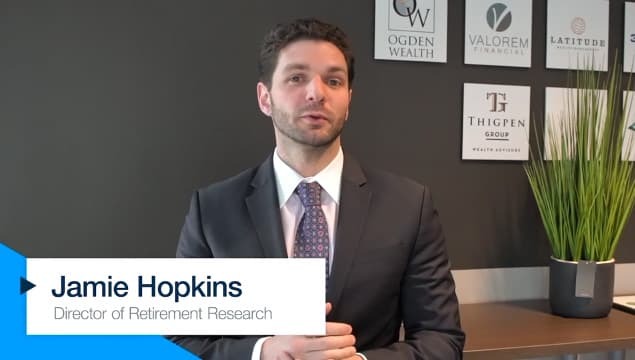 Retirement income planning is challenging, and that is a good thing for advisors because you can add tremendous value to your clients by helping them have a more secure retirement. Jamie Hopkins, Esq., LLM, MBA, CFP®, RICP®, is the Director of Retirement Research at Carson Wealth and a former professor of Taxation at The American College, where he helped co-create the Retirement Income Certified Professional® (RICP®) education program. Jamie strives to increase the retirement income security of Americans by delivering practical and trusted retirement research and education. His most recent book, "Rewirement: Rewiring The Way You Think About Retirement," details the behavioral finance issues that hold people back from a more financially secure retirement. He has been selected by InvestmentNews as one of the top 40 financial service professionals under the age of 40 and was also selected by The American Bar Association as one of the top 40 Young Attorneys in the country. In 2017, Trusts & Estates Journal awarded Professor Hopkins the Distinguished Author Award for his article on the Department of Labor Fiduciary Rule. He holds his LLM in Taxation from Temple University School of Law and his J.D. from Villanova University School of Law. Good article, however, conspicuously absent was any mention of Long -Term Care insurance. How is that possible when discussing the absolute necessity of retirement income planning? Any planner who doesn’t educate clients about this form of asset and family caregiver protection OR partner with someone who will, is failing fiduciary responsibility.